It seems there are many less believers (true followers of Jesus) in the world than in recent history. 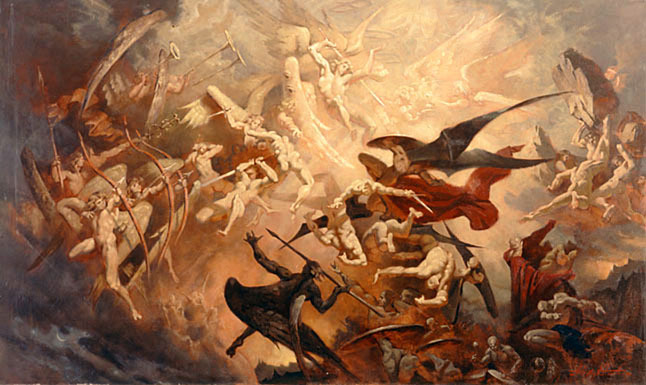 The battle for souls is fierce and the age old struggle of good vs. evil is heightened. I believe there is a direct correlation between the veracity and volume of the prayers of God’s people and the strength or wane of the spiritual powers in heavenly conflicts with evil. Conversely, as people of faith become less in numbers there is less prayer and a direct correlation to an increased amount of evil present. The Holy Spirit is linked to His people. As followers of Jesus Christ, we are directed to bring EVERY prayer and petition to the foot of the cross. When we do this, through some preternatural process, we are power – charging the Spirit and supporting the efforts of His angels in battle with evil. I am not saying that God’s will and way is not possible without our prayers; He is sovereign and will do as He pleases. However, God has invited humans into the battle for a purpose. Prayer warfare is part of that purpose. In worship we are submitting our will to God. This earthly union with our Heavenly Father follows the ultimate example of His Son, Jesus Christ. “Lord, not my will be done, but yours as it is in heaven AND on earth”. Part of the success of Satan’s battle is when we align ourselves with him. We do this everyday in many ways. The most obvious is through consistent desire to have it our own way. We know best, God does not. When we hold on to that, we are mimicking the deceiver, who thought he knew best and was higher than God. The price paid for that sin was expulsion from Heaven. That meant war. Like people who fight for their own survival in war-torn regions of this earth, all humanity groans and strains in the ultimate battle for our souls. There are no civilians in this war, only human casualties. The key is to recognize this and for those who count themselves within the body of Christ, to put on the full armour of God to battle. We must be like the Marine recruiters; God too is “looking for a few good men”…we are to reach out to others; sharing the truth of God’s word to friends and enemies. We are called to pray and then pray again over these little ones that the Spirit will draw them into God’s kingdom. We must proclaim the spoken truth of the Gospel to others; when we do we are forging links in Satan’s chain to keep him at bay in the hearts and minds of the unsaved. Where Jesus is present, Satan must flee – and the gates of hell cannot prevail against Him, His children and those who are predestined in Him. Jesus has warned apart from Him, we can do nothing. We are reminded time and again to stay close to the vine. We are to keep our paths straight for His righteousness and we are to gird ourselves for battle by steeping our minds and hearts in God’s word. We are asked to seek Him first, each morning and “all these things” shall be given to us. Even now, come Lord Jesus. Amen and Amen. A Sovereign God, Activating Prayer, Evangelism, God's View vs. World View, Living For God, Observations, What Is Truth?